Burger KingBurger King’s new Crispy Pretzel Chicken Fries. Burger King is launching Crispy Pretzel Chicken Fries, which covers chicken with a salty pretzel breading. The limited-time offering follows in the footsteps of other Chicken Fries at the chain, including the Cheetos Chicken Fries that launched in 2016. Over-the-top new menu items can grab customers’ attention and convince them to visit a chain that they may not have dined at in a long time. Burger King has a wild new menu item. On Thursday, the fast-food chain is launching Crispy Pretzel Chicken Fries for a limited time, Burger King told Business Insider. The new menu item, which has a suggested price of a little over $US3, takes fry-shaped chicken and coats it with salty seasoned pretzel breading. 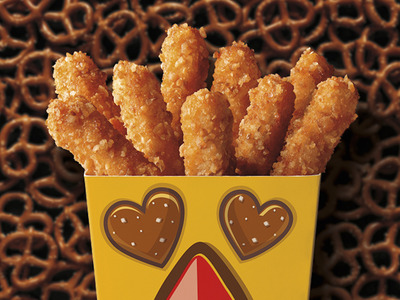 Crispy Pretzel Chicken Fries are a twist on Burger King’s original chicken fries, which debuted as a limited-time item in August 2014. Chicken fries were later added to the menu permanently because of popular demand. Since then, Burger King has rolled out a number of absurd variations, including Cheetos Chicken Fries two years ago. Over the last few years, the chain has used uncommon menu items – such as Mac n Cheetos in the summer of 2016 – to boost foot traffic at the chain. Jonathan Deutsch, a professor of culinary arts and food science at Drexel University, told The Motley Fool soon after the launch of Cheetos Chicken Fries that the limited-time menu item was part of a wider strategy. In 2018, many customers need that type of incentive to visit a chain. In an extremely competitive industry, fast-food chains need whatever edge they can get. And, for Burger King, Crispy Pretzel Chicken Fries could be the edge the chain needs.